Unlike other products, the size is huge. Although there will be advantages and disadvantages, it was a batch because I was looking for a big and long product. And, even though it is a KTC product, cheap places are also good. This review is about item#7128091. After all it was not cheap. I understood that it was better to use a better tool than an amateur. It is recommended. This review is about item#7128082. Even though KTC 's goods are fixed price lists, the reliable items are cheap and can be purchased and saved. So far, I purchased multiple sets. I bought 9 sets. Because it is a long type it is easy to apply force and easy to use. Although it is a KTC brand, it is cheap. This review is about item#07128091. I replaced it because it used to be old. We are satisfied with correspondence, goods, packaging. I'd like to purchase again. I want you to attach a hook with a hole to the hexagonal wrench holder. Maintenance of the family city cycle. I got lost as a set of KTC's bicycle dedicated ball points. Since there was a comment saying "There is nothing" on the round shaft, there is no problem at all using this product, actually. I think that it is very affordable in terms of price. There are parts that are worrisome a little longer overall length, but if you can use it as a short type if you want it you can comfortably use it. I think that it may be a little too long, even a bit short size. Long is KTC this price, is normally good. It is Bondas but the long is here. Even in a narrow place. It is very convenient because it can be used. This review is about item#07128082. I bought it for the chain adjustment of ZR 400 D, but I did not have the required size and purchased a separate hex wrench. This product is used for maintenance of other places. Because the straight part is long, I think whether it is good to apply force firmly on the lever principle. For Kawasaki motorcycle chain tension, if you buy any set! It is! I thought, I bought it, but the size required for the chain tension was nothing to do with 12mm? It was ineffective in this set. However, I tried using it in other places, but since it is long, I was able to tighten it firmly. Nine wrenches are included in the double-folded holder, but I think that it is the easy way to store it. Is it about 1,000 yen higher than other companies? It is unknown whether or not an amateur can understand the difference in precision for this 1,000 yen, but the product itself is truly KTC, and it is safe to use it securely without bending freely like a cheap article. It is user-friendly that the back is a ball wrench. As long as it is not a journey, a wrench that has enough length is easy to use. Even hexagonal genuine screw materials are cheap and many licks are used, so basic tools like this are important as we are licking as weird tools are used. KTC is not too expensive for individual purchase, so it is good that the accuracy is perfect. It was good to have used a coupon of just 1000 yen discount, but even if you purchase it normally, it is a bargain because it also comes with 9 sets & ball points. 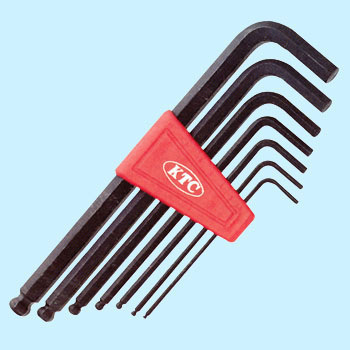 TRUSCO Hex key wrench set,lomg type 9 pcs.